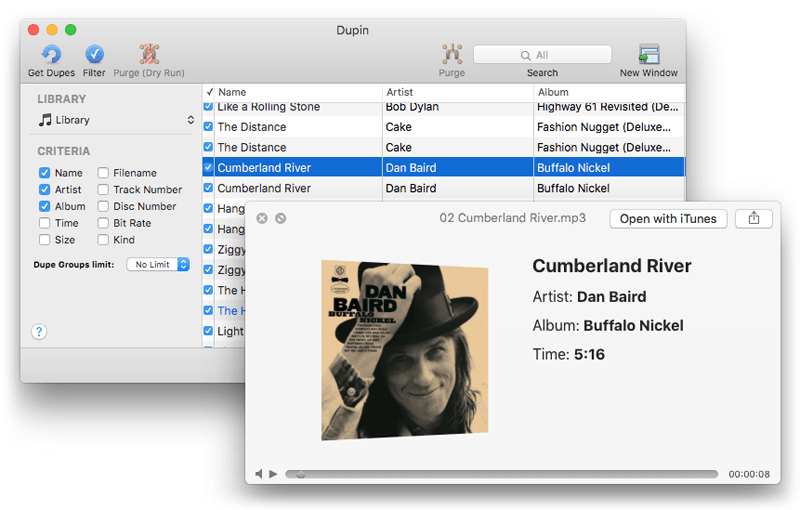 Dupin vs. TuneUp: Which One Is a Better iTunes Companion? Let’s be honest, who wouldn’t want more free space on a Mac? 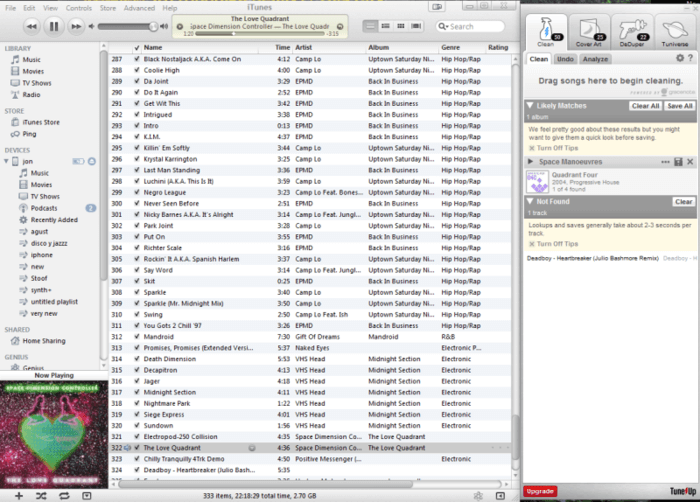 Regular iTunes library management is a crucial habit if you intend on saving maximum space on your Mac. Free storage is needed for optimal Mac performance and for keeping stuff which, unlike iTunes duplicates, you actually intend on keeping. Of course, you can find duplicated song copies by hand or by using iTunes’ built-in tool, but things get progressively more difficult as your library grows. That’s where companion apps such as Dupin and TuneUp step in to save the day. What is a companion app for iTunes? 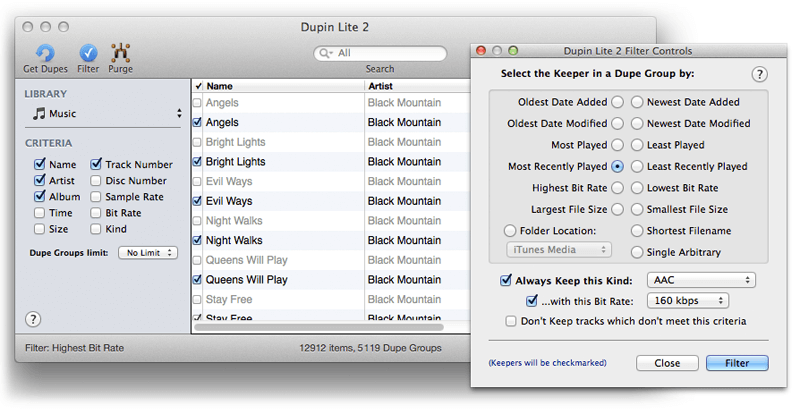 Take Dupin Lite 2 for Mac for example. The application from app developer Doug Adams is a supercharged version of iTunes’ very own duplicate finder. Instead of using the standard built-in tool for title-based results, you can download Dupin from Dougscripts website to locate, sort and purge duplicates based on your custom criteria. TuneUp is another prime example of a companion software you can download for Mac. Developed by TuneUp Media, this app is more than just an iTunes cleaning alternative (especially if you’re running early iTunes versions prior to iTunes 12). On top of finding duplicates, Tune Up plugin can fix mislabeled music tracks and fill in cover arts. At first glance, both applications are a definite upgrade over iTunes built-in utilities, but which one is a better pick when compared side by side? When comparing software, it is necessary to take into consideration the purpose of these applications. They indeed share similarities, yet understanding their differences may play a decisive role in your choice and help determine how to use the app to its full potential. Let’s look at the similarities first. Both applications focus on organizing and managing your iTunes library. Without a doubt, both place emphasis on dealing with music duplicates as they not only clutter your library with repeated entries but also take up precious disk drive space. This is where differences begin to show because each app puts its own spin on it. As already mentioned, Dupin and Tune Up both display finding and removing media duplicates as their main medium of dealing with iTunes clutter. Without a doubt, Dupin has the edge over TuneUp in finding duplicates. Dupin Lite 2 puts its best foot forward by letting you scan Music, Movies, Podcasts, Audiobooks and even TV Shows. You also have the choice of selecting the entire Library to get search results from all categories simultaneously. On top of that, there is a set of multiple matching criteria to choose from. Ultimately, by tinkering with Dupin criteria preferences, you find exact duplicates as well as very similar items. TuneUp features a more basic approach to duplicate finding. TuneUp media call it DeDuper. Unlike Dupin, DeDuper does not have any configurable settings, but only uses waveform recognition to identify duplicates. If you intend on freeing up space on your hard drive, then you should know that Tune Up will not permanently remove duplicate tracks, but will place them in a folder titled TuneUp Duplicates. You will have to manually access the folder using Finder to completely delete these files from your Mac. On the flip side, TuneUp app takes the cake when it comes to additional iTunes Library management features. While Dupin functionality is solely focused on duplicates, TuneUp provides its users with helpful features to deal with inconveniences such as missing cover art, track, artist or album info. The ‘Clean’ is going to be your go-to tab to make use of the features. Select Analyze module within the tab to initiate a scan that goes through your entire collection looking for missing info. Once you have your results, go to iTunes and drag mislabeled tracks to the Clean module. Tune Up will automatically detect the missing info. You can easily save or cancel changes with a single click of the button. Now that the big picture has been painted, check out the pricing and functionality you can expect from these apps. Locate sets of iTunes duplicates based on customizable criteria. Set custom preferences using filters to automatically keep certain tracks from a number of duplicates. Insert kept tracks to iTunes playlists. Find tracks in iTunes and Finder. Find and fix mislabeled track information. Find and fix missing album cover art. Locate and remove duplicate music tracks. Ultimately, the choice of a perfect companion comes down to your needs. TuneUp may be favored by the users who have stacks of CDs or even vinyls waiting to be ripped to Mac (you might wanna check out Apple Discussions threads related to TuneUp). Whereas Dupin lite 2, thanks to its affordable price and customizable matching, will be a superior companion choice for users who have already moved on to music streaming and need to rid their iTunes libraries of duplicated tracks (Dupin threads on Apple Discussions). ← Duplicate Annihilator vs. PowerPhotos Review: Who Wins?